I LOVE playing cards. That is to say...I love playing CARDS and I love beautiful, unique decks of playing cards. If they are customized, all the better. You can play poker or solitaire with virtual playing cards online, but there is something about handling a REAL deck that is very satisfying. Try wowing your friends with your virtual card shuffling skills...Not gonna happen! A great deck can be a work of art and can make a wonderful affordable gift, especially when personalized. This is my review of some of the best decks of playing cards on Zazzle...The best place to find customizable Bicycle playing cards. The history of playing cards goes all the way back to 9th century China, during the Tang Dynasty. They would not become popular in Europe for another 500 years, during the 14th century. Playing cards bearing the four suits most familiar to those of us in the western world today originated in France in the late 15th century. Of course everyone has seen the famous painting of dogs playing cards, but the relationship between art and playing cards does not stop there. The back of a playing card would be like a blank canvas without some good graphics. Card manufacturers have produced some amazing looking decks over the centuries. Even the back of a standard Bicycle playing card has a lovely elaborate design. If you examine it closely you'll see what I mean. When people get together to play a game they spend a good deal of the time looking at the back of their opponent's hands, so it's nice to have something to look at that pleases the eye. I've had many decks over the years, some inherited, some collected from estate sales, but the cards I like the most are from a deck I got when I was five or six. It was the artwork on the back that made my eyes light up...A black cat with large jewel-like green eyes on a bright purple background. Without that cat they would have been just another deck and long forgotten. I still have about five of those cards left, and that cat still makes me smile. 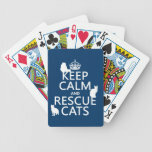 When I got my zazzle store (kischtorium) I was delighted to find that I could include playing cards along with my other products. It's been fun to find vintage illustrations and to create original graphics to apply to the backs of these cards. With so many wonderful artists on zazzle there is literally (almost) no end of designs to choose from. Because most of them can be customized it's a great place to buy decks as a gift, wedding favor or for a business. Because they are manufactured by Bicycle they are quality cards. This part of my article isn't JUST a shameless plug for my zazzle store....Even if I didn't sell on zazzle I have no doubt that I would go there when I wanted to buy a new deck because I love to have so many great design choices in one place. Some of the decks you can find on zazzle are pictured below. The first two are mine...I couldn't resist the urge to share some of my designs with you, but the rest are from other people's zazzle stores. I chose them for this article because in my humble opinion, they are examples of some of the BEST looking decks around. Pretty and a little scary, sugar skulls are a staple when celebrating The Day Of The Dead in Mexico, the US and elsewhere. A popular and fun design. 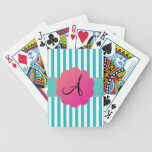 These monogrammed playing cards are provide a classic look without being boring. 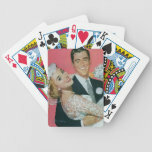 I think these beautiful vintage illustrated playing cards would be fantastic wedding favors. Playing cards can be a way to express what you care about. I never met a cat I didn't love. Looks like zombies have invaded...better wear a helmut! 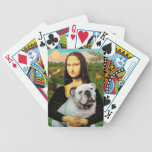 Mona Lisa Has A Bulldog? Yes, and a fine looking one at that. This deck really makes me smile...a BIG smile. I hope you've enjoyed my little review as much as I've enjoyed writing it. Play on! What's the best deck of cards you've seen (please keep it clean-thanks!). Well, it may be harder than it appears. Much harder. Unless I play with a fractals software. Yes, that a great idea, I look forward to seeing them! I think some geometric designs, too, would look great on the back of playing cards. You just gave me a Zazzle idea. This is one product I have not noticed on Zazzle. I have been wanting to Interface more there and polish my store. The day will come, eventually. This is a fun product. Don't have any yet, but I should get around to it. Really interesting and unusual article. I used to love playing cards when I was a kid! 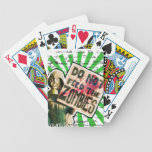 I love that Zazzle gives us the option to create our own style of card decks. These are all fun! These are cool. So many ideas for decks of cards! We used to play a lot of canasta, back in the day. These are certainly some of the best variety of playing cards I have seen. Zazzle definitely has a wide range of designs. Nice collection of playing cards and great artwork. Play the fun game where one player ask a question from a black card and all players answer with the funniest white card they have. It makes for a hilarious time together. 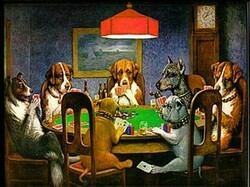 Poker parties way are the perfect way to keep in touch with your friends. Read on to find out some poker party ideas as well as advice on how to throw the perfect poker night.